Welcome to Amsterdam, a fascinating 700 year old city of picturesque canals, world class museums, theatres and cafés. You will be met and transferred from the airport to your Emerald Waterways luxury river cruise ship. After boarding, enjoy some time at your leisure to explore Amsterdam. This evening join your fellow travellers for dinner on board. This morning we venture to Zaanse Schans, which is one of the highlights of the Netherlands, just outside Amsterdam. This vibrant and stunning living and working community that dates back to the 18th and 19th centuries, with many farms and windmills. Tonight, the Captain will be delighted to welcome you to a gala dinner. Start today with an included visit to Netherland’s second largest metropolis – Rotterdam. Its futuristic architecture, give the city the title of Netherland’s architectural capital, and during your city tour you will experience main highlights like the Erasmus bridge and the Beeldenroute Westersingel. Today you will arrive in Veere, an area that was heavily flooded in 1953, and led the Dutch government to commission the Delta Works to protect the province from the open sea. 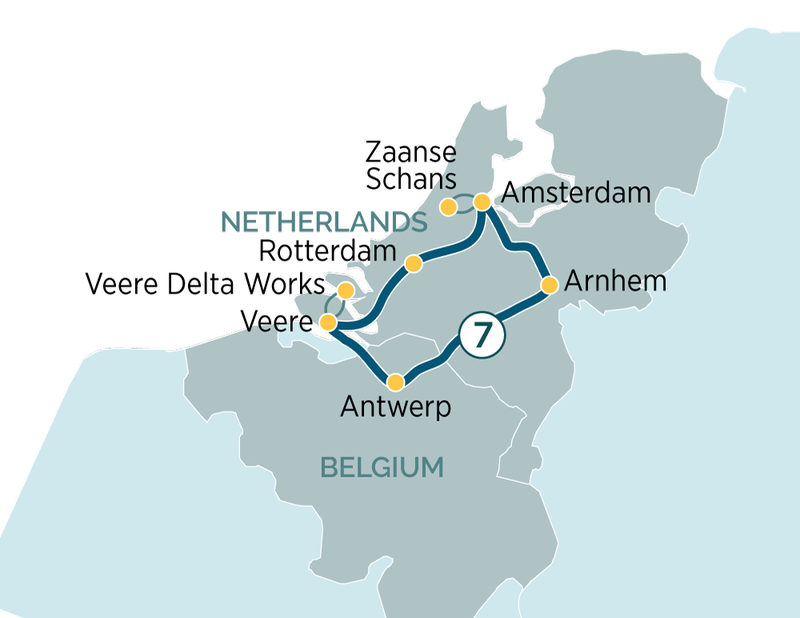 We will visit the Delta Works project, known as the Storm Surge Barrier, due its series of dikes, sea walls and locks all the way up to Rotterdam in South Holland. We start the tour by visiting the outer wall, and then you will watch an educational and interesting film on its construction and the floods that preceded it. This morning we arrive in Antwerp - Belgium’s biggest port, positioned on the River Scheldt with a large harbour linking to the sea. As Belgium’s second largest city, it has been pivotal in the country’s history of occupations and conquests. Home to the famous Baroque artist Pieter Paul Rubens, it attracts art lovers and diamond dealers from all over the world. Having been decimated during WWII, today the city is modern and organised, yet still retains an intriguing medieval heart. Enjoy the guided walking tour of the city centre, passing by its café-filled cobbled lanes, admiring the Renaissance Town Hall and the unique Gothic Cathedral of Our Lady, the symbol of Antwerp before passing through the charming 16th century inner yard, the ‘Vlaeykensgang’. *** Please note, you can only choose either included tour of Antwerp or the DiscoverMORE option, as both tours run at the same time. After a relaxing morning spent sailing through the Dutch waterways, passing its wonderful windmills and quaint traditional villages, you will arrive in Arnhem. Most famous for its great battle during World War II, its iconic bridge - the sight where the British forces were captured. You will tour the Airborne Museum Hartenstein which is dedicated to the Battle of Arnhem In 1944. The main building was the headquarters of the British command during the battle, and now houses exhibits of military uniforms and weapons. *** Please note, you can only choose either the included guided tour or the EmeraldACTIVE bike tour option, as both run at the same time. This morning you have a choice to visit the Keukenhof Gardens - the most beautiful spring garden in the world and Europe’s largest. Situated in the heart of the tulip farm area of Holland, it boasts incredible displays of different flowers and plants, with more than seven million tulips, daffodils and hyacinths filling over 79 acres with colour and fragrance.After lunch, you will have free time to explore Amsterdam on your own. After breakfast, it is time to farewell your fellow passengers and disembark the ship for your transfer to the airport for your onward or homebound flight.